At today's rates, it would take 45 years to pay for itself. Bitcoin had a good run, peaking at almost $20,000 in 2017. The draw isn’t just that you could have become a millionaire if you bought at the right time; it’s also that you can “mine” cryptocurrency on your own computer, as if you were summoning wealth from the digital nether. 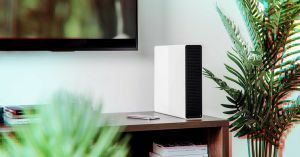 To cash in on that public interest, this week a startup called Coinmine announced the Coinmine One, a $799 plug-and-play crypto mining device that looks like a Mac crossed with a space heater. It’s an elegant shade of white, and you control it with a smartphone. Coinemine has some pretty legit financial backing, as well: investors from Coinbase and other “notable cryptocurrency advocates” supported the venture, which called the Coinmine One the “first plug-in device, mobile app and operating system” in a press release. It’ll even set up a wallet for you and store your mined crypto on its own servers. Sounds great. Too bad it’s extremely unlikely to make you a significant amount of money — if you even manage to break even. The major problem: Coinmine’s specs are middling. It uses less power than a PlayStation 4 at 120 watts, and its GPU — mining is usually demanding on your graphics card — is an AMD Radeon RX570, a card you’d find in a college student’s entry-level gaming tower. It also takes cheap electricity to make a profit in mining right now. We plugged Coinmine One’s power consumption, hashrates — that’s the speed of mining calculations, basically — and average cost of electricity in the U.S. into a mining calculator called CryptoCompare. There’s good news and bad news. The good: you’ll make a profit at today’s value of Ethereum. The bad: it comes out to about $1.37 a month — not even enough for a cup of coffee. You’d make even less in Monero, at just $0.70 a month. And you’d actually lose $1.53 each month on Ethereum Classic, once you factored in your electric bill. In other words, according to CryptoCompare — and other calculators we used as a reality check — it would take you more than 45 years of mining Ethereum to pay off the $799 you paid for the Coinmine One. And that’s if you ignored taxes and assumed not only that prices will hold steady for the entire period but that technological progress would freeze, meaning other people’s computers would never get any faster. Oh, and did we mention that Coinmine is taking a five percent cut? Coinemine CEO Nivi, though, was unphased by all this. Of course, that’s based on a number of assumptions — that there’ll be a next hot coin that’ll spike in price, for instance, and that Coinmine, and you, will anticipate it correctly. And that’s without getting into yet another catch: even if a hot new alt coin comes to market, and miners across the globe are revving their engines, you’ll have to wait for your Coinmine One to officially support it. As of right now, it only supports Ethereum, Ethereum Classic, Monero and Zcash, with support for other cryptos “coming soon,” according to Coinmine’s official website. And in any case, if there’s a hot new altcoin that you think will eventually rise in price, it seems like you’d be far better off buying $799 worth of it up front, instead of spending years mining it. Does the Coinmine take a lot of fussing, sweat and tears out of the crypto mining process? Likely. The company’s custom operating system, MineOS, will probably make the process as easy as ever. The whole thing is reminiscent of Apple: a beautifully-crafted walled garden experience that you’re gonna have to pay extra for. Neither the Coinmine One nor any other mining hardware will guarantee you a profit. In fact, you’re almost guaranteed to lose money at today’s rates — unless you have access to a hydropower dam in mainland China and a warehouse full of graphics cards. At the end of the day, it might be beautifully-designed — but in practice, without a red-hot crypto market, the Coinmine One is an over-engineered space heater.